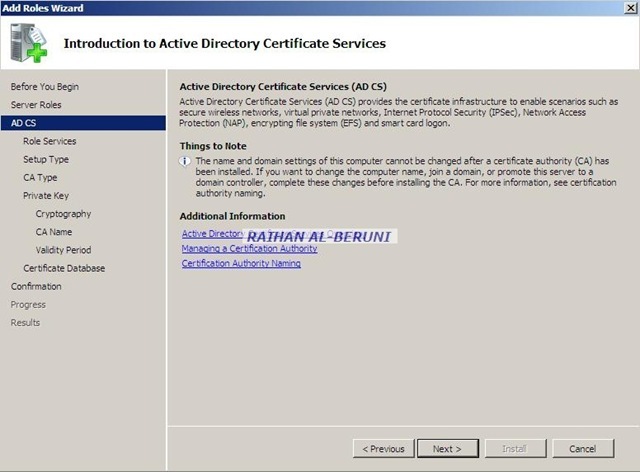 Microsoft Active Directory Certificate Services (AD CS) in the Windows Server 2008 provides customizable services for creating and managing public key (PKI) certificates. You can use AD CS to enhance and implement security by binding the identity of a person, device, computers or services to a corresponding private key. 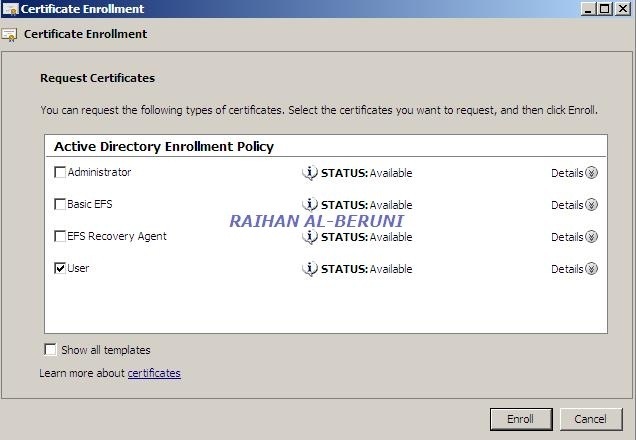 AD CS also includes features that allow you to manage certificates enrolment and revocation if necessary. 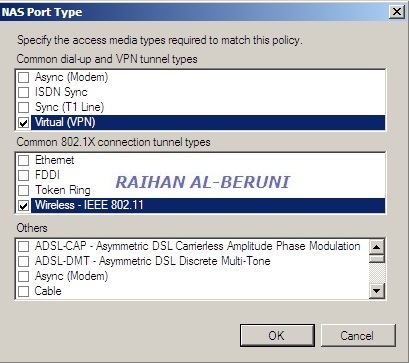 Applications supported by AD CS include Secure/Multipurpose Internet Mail Extensions (S/MIME), secure wireless networks, virtual private network (VPN), Internet Protocol security (IPsec), Encrypting File System (EFS), smart card logon, Secure Socket Layer/Transport Layer Security (SSL/TLS), and digital signatures. 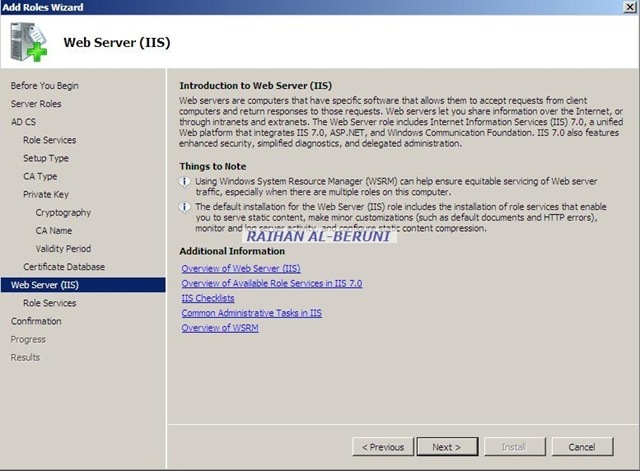 Standard hardware works for windows 2008 AD CS server. Depending on individual needs and capacity of spending, you may virtualise or use separate AD CS server. 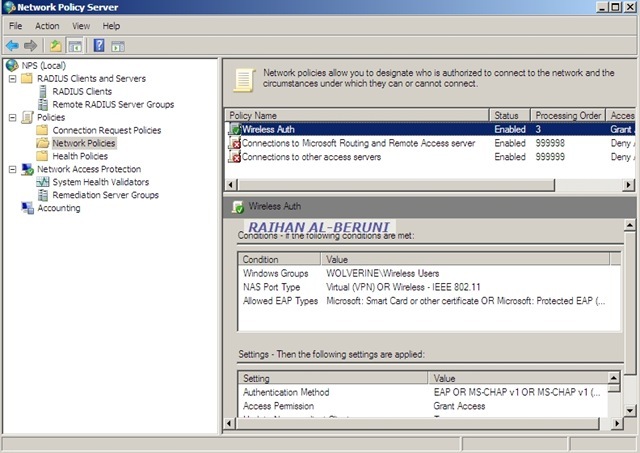 If you have more then one domain controller, you can configure one of them as CS server. It doesn’t hurt anybody. 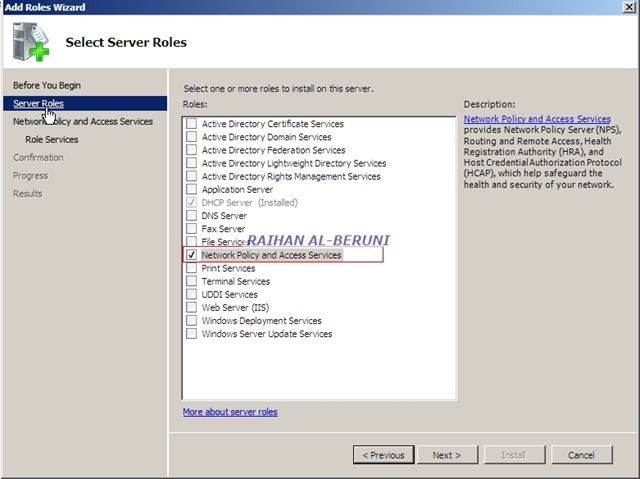 AD CS requires Windows Server 2008/2003 and Active Directory 2008/2003 Domain Services (AD DS). Here, I am going to talk about Windows 2008 AD CS. Although AD CS can be deployed on a single server, many deployments will involve multiple servers configured as CAs, other servers configured as Online Responders, and others serving as Web enrollment portals. Creating an optimal design will require careful planning and testing before you deploy AD CS in a production environment. 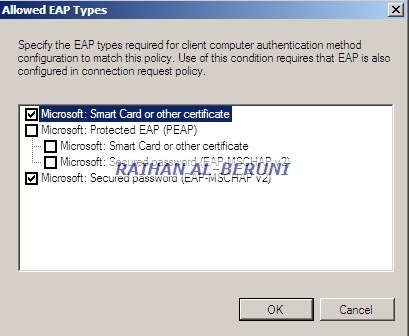 Microsoft Windows XP, Windows 7 and Apple Mac OSX 10.5.x (Key Chain) can request and enrol in Microsoft Enterprise certificates. 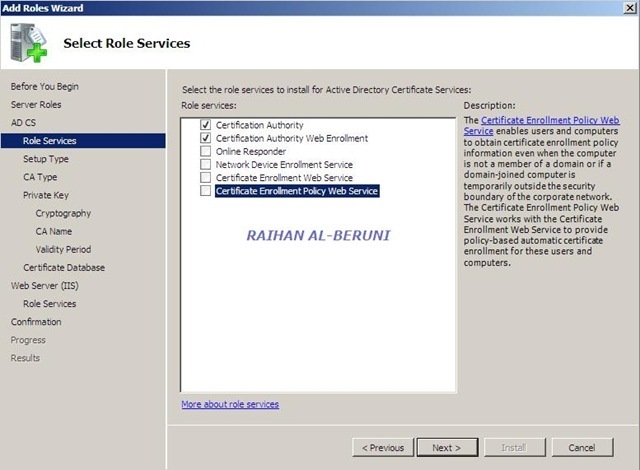 Certification authorities (CA) Root and subordinate CAs are used to issue certificates to users, computers, and services, and to manage certificate validity. 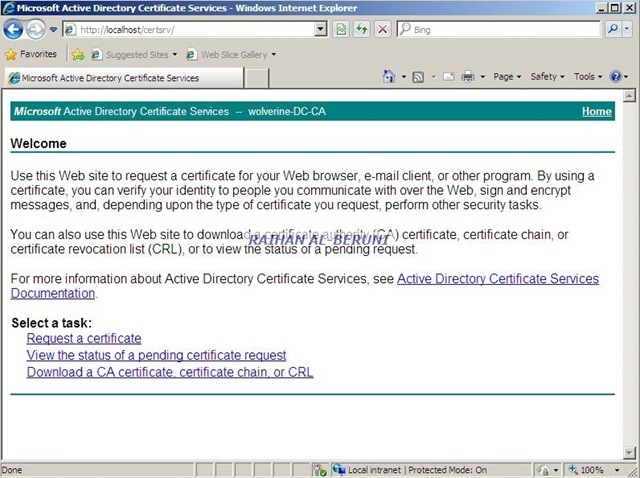 Web Enrollment Web enrolment (http://servername/certsrv) allows users to connect to a CA by means of a Web browser in order to request certificates. Improved enrollment capabilities that enable delegated enrollment agents to be assigned on a per-template basis. 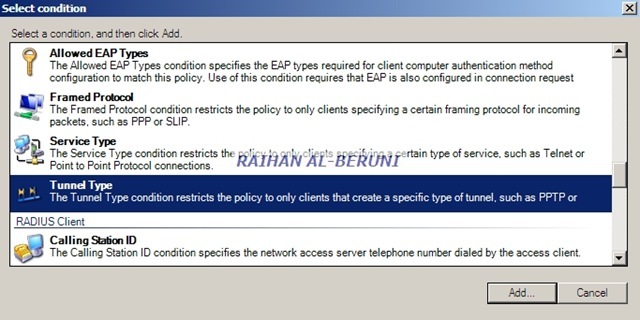 Integrated Simple Certificate Enrollment Protocol (SCEP) enrollment services for issuing certificates to network devices such as routers. Scalable, high-speed revocation status response services combining both CRLs and integrated Online Responder services. Choose a backup location and attach media, if necessary. Log on with local administrative credentials to the CA computer. On the Welcome page of the CA Backup wizard, click Next. On the Items to Back Up page, select the Private key and CA certificate and Certificate database and certificate database log check boxes, enter the backup location, and then click Next. On the Select a Password page, enter a password to protect the CA private key, and click Next. On the Completing the Backup Wizard page, click Finish. Click Start, point to Run, and type regedit to open the Registry Editor. HKEY_LOCAL_MACHINE\SYSTEM\CurrentControlSet\Services\CertSvc, right-click Configuration, and then click Export. 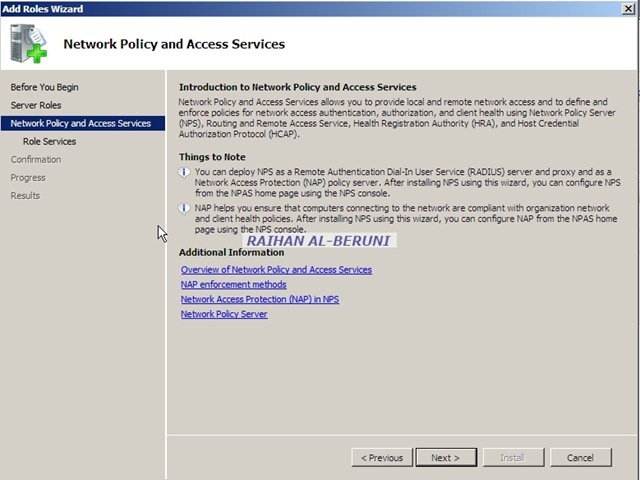 Log on with local or enterprise administrator permissions to the CA computer. 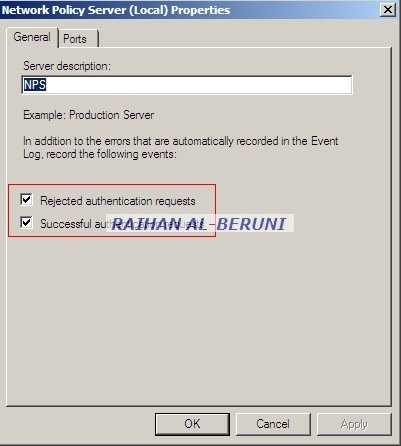 Click Start, click Run, type servermanager.msc, and then press ENTER to open Server Manager. On the Action menu, click Add Roles. If the Before you Begin wizard appears, click Next. 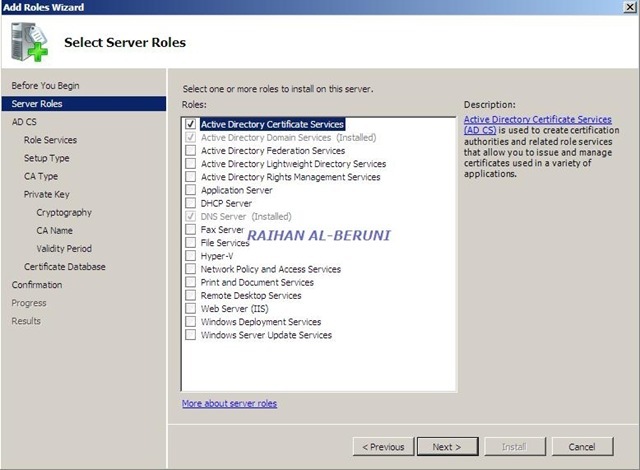 In the list of available server roles, select the Active Directory Certificate Services check box, and click Next twice. 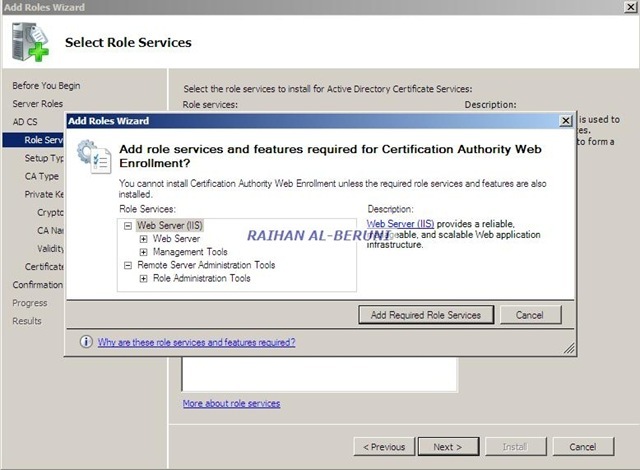 Make sure that Certification Authority is selected, and click Next. Choose if you are migrating to an enterprise or stand-alone CA, and click Next. 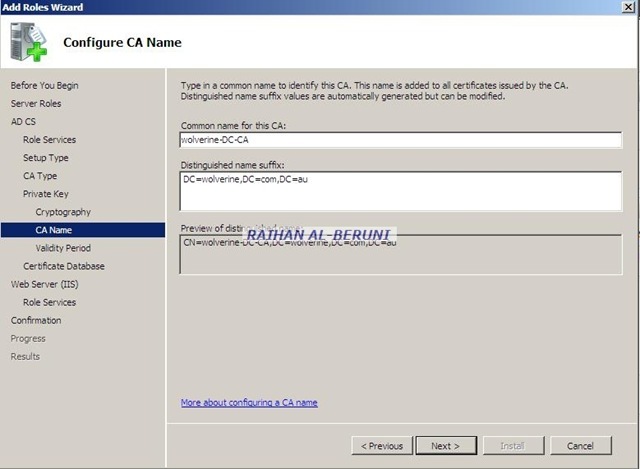 Specify either Root or Subordinate CA, depending on the source CA, and click Next. At this stage, you have a choice between creating a new private key or using an existing private key. Use the second option for a migration. 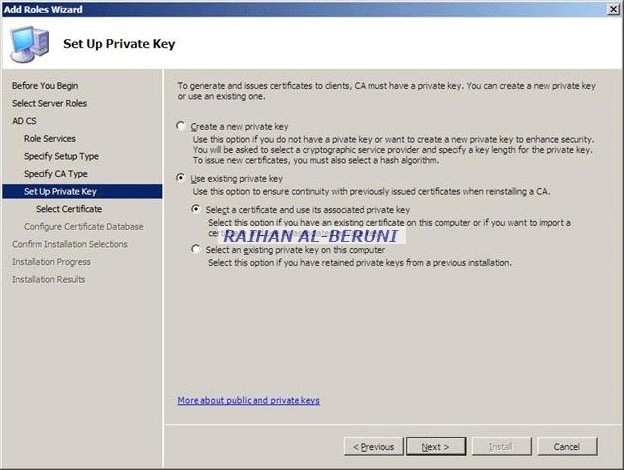 To create a new CA certificate and key, select Create a new private key. For a migration, on the Set Up Private Key page, select Use existing private key. Click Select a certificate and use its associated private key, and click Next. 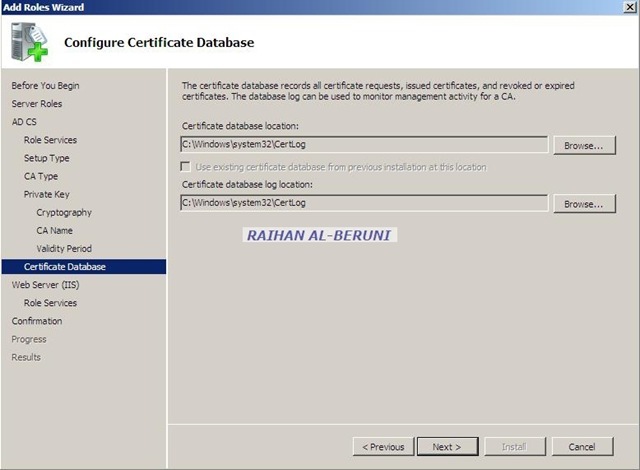 If the CA certificate has been installed on the computer, it will be listed in the Certificates box. Otherwise, click Import to import a certificate from the .pfx file created by exporting the CA certificate and private key from the source CA. 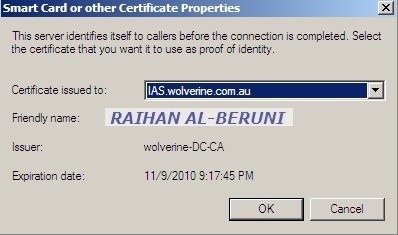 Click Browse, and locate and select the file containing the certificate and private key exported from the source CA. 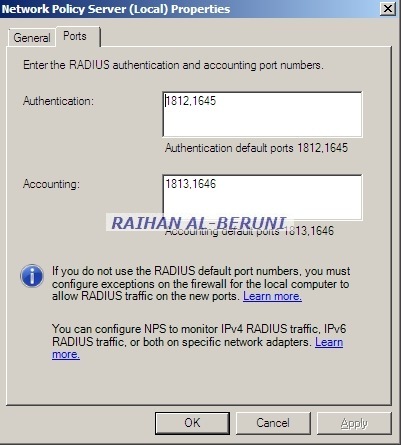 Enter the password you selected when exporting the CA certificate and key from the source CA, and click OK. 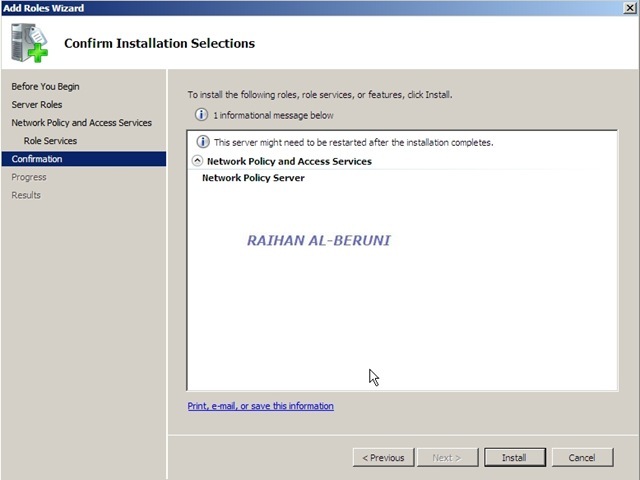 Complete the rest of the installation wizard to finish installing AD CS. 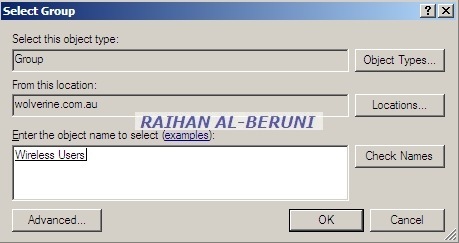 If the CA is installed on a workgroup computer or an existing private key was reused, optionally set the distinguished name suffix, and click Next. 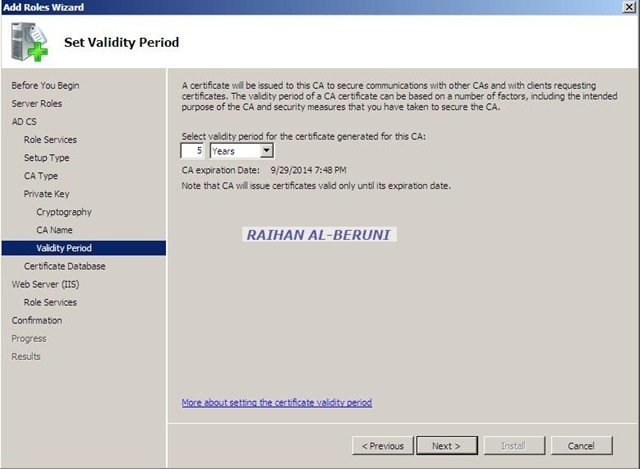 If the CA is a new root CA, set the validity period for the certificate generated on the CA, and click Next. Otherwise, skip this step. 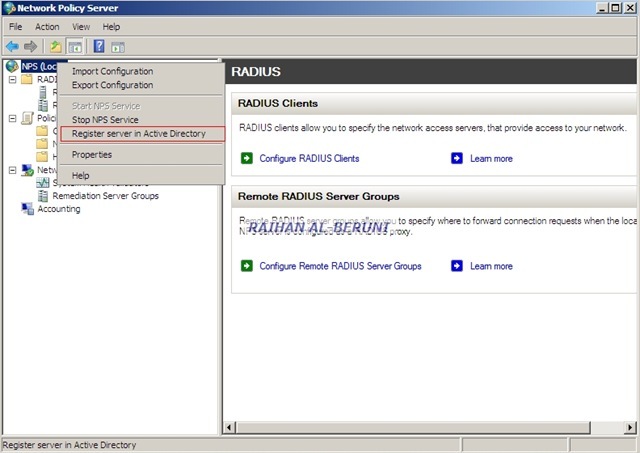 If required, configure the database location paths, and click Next. 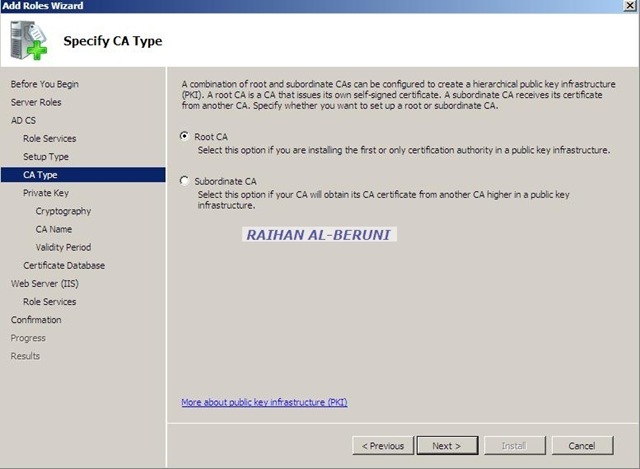 If you are installing a subordinate CA, select whether to save the certificate request or submit it directly to the CA, and click Next. To install AD CS, click Install. 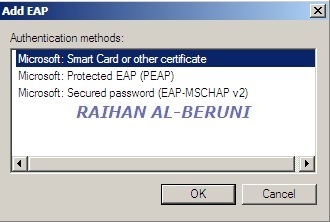 Log on with administrative credentials to the target CA computer. On the target CA, use the Certification Authority snap-in to stop the CA service. Double-click the .reg file previously edited to open the Registry Editor. Confirm that the registry keys were imported, and close the Registry Editor. 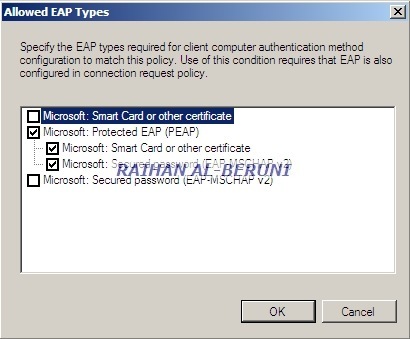 Additionally, use the Certification Authority snap-in to verify the following settings. Right-click the node with the CA name, and click Properties. 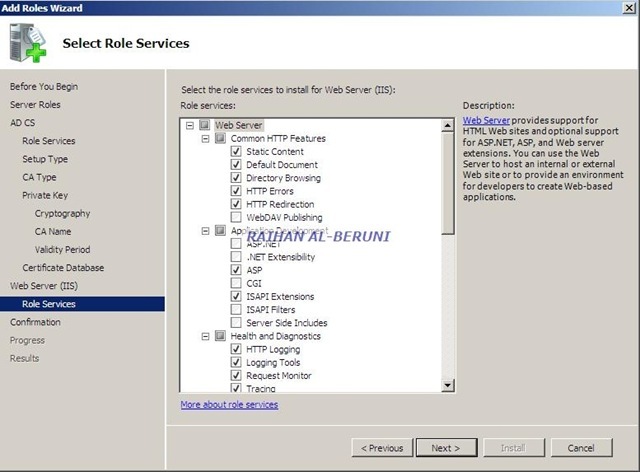 AD CS role services are managed by using Microsoft Management Console (MMC) snap-ins. 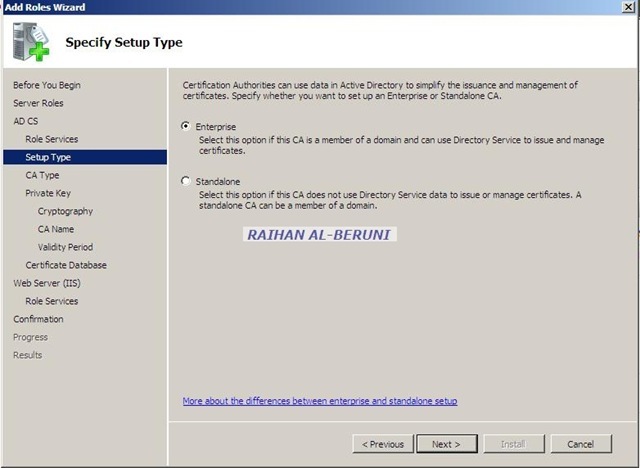 · To manage a CA, use the Certification Authority snap-in. 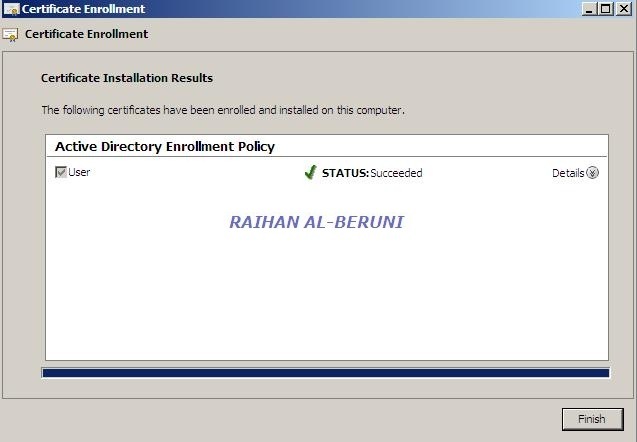 To open Certification Authority, click Start, click Run, type mmc, click File, click Add/Remove Snap-in, click Certification Authority, click Add, click OK, and then double-click Certification Authority. · To manage certificates, use the Certificates snap-in. To open Certificates, click Start, click Run, type mmc, click File, click Add/Remove Snap-in, click Certificates, click Add, click OK, and then double-click Certificates. · To manage certificate templates, use the Certificate Templates snap-in. 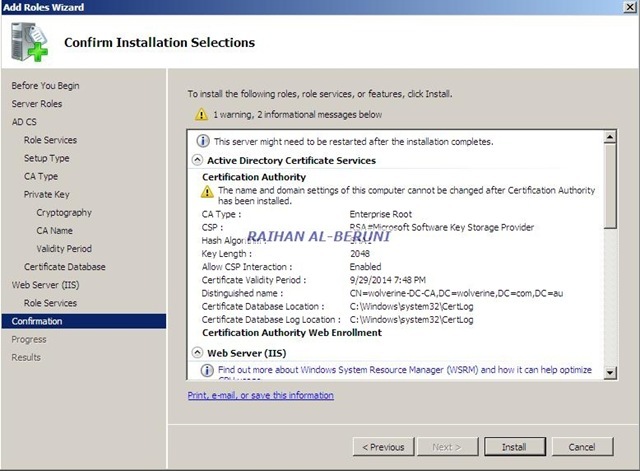 To open Certificate Templates, click Start, click Run, type mmc, click File, click Add/Remove Snap-in, click Certificate Templates, click Add, click OK, and then double-click Certificate Templates. · To manage an Online Responder, use the Online Responder snap-in. To open Online Responder, click Start, click Run, type mmc, click File, click Add/Remove Snap-in, click Online Responder, click Add, click OK, and then double-click Online Responder. Query the list of serial numbers of all certificates that have an archived key associated with them.